I've spent the last 3-4 evenings trying to level and align my lathe properly, but have had some marked periodic eccentricity in the spindle, that was running out and showing significant play (lateral and axial) at the spindle nose. The lathe is a 48 years old and was auctioned off by a local college last year, but have hardly used it until the last month. I dusted off the manual and did some research on line and decided to tighten up the spindle preload (done via nut on spindle at rear of headstock) - quick diagram and description from the lathe manual. I only had a cheap Chinese 'fake Mitutoyo' dial indicator, which is very twitchy and gives little confidence, so I cautiously increased the preload until I was able to reduce the play and get around 2 thou periodic runout at the spindle nose. 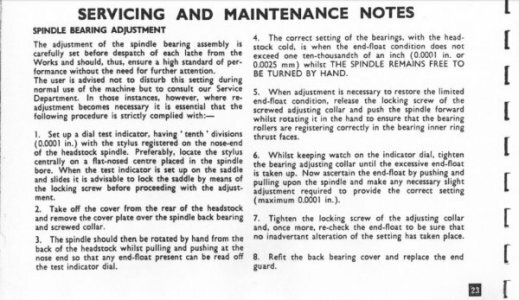 The adjustment was not smooth, in that I could turn the nut by hand to tighten, and this would make the spindle tight to turn but it loosened up again after a couple of turns of the spindle and I could then nut was loose - repeated 4-5 times before stopping. Finishes were greatly improved, but quickly deteriorate as I work away from the headstock and at 6" the eccentricity is markedly visibly (>15 thou) . I did various checks with cam lock chucks, centres and a taper mounted collet, but these all confirmed the excessive run out. I ordered in a 15" MT4 ground test bar and a proper 0.0001 Mitutoyu indicator, so I could properly measure and test this before making any further adjustment or investigation. However, these have merely confirmed the errors and I had to strip back the head and have a proper look to see what's going on. On indicating both ends of the spindle I found that the error was more pronounced at the rear of the spindle and that this was the source of the eccentricity (not a bent spindle). I removed the preload nut and had a proper look - the rollers all seem to rotate correctly and looks okay externally, but looking at the inside of the bearing with an inspection camera I think I have a visible crack in the cone..... The front bearing appears ok. There are some other marks on the cone visible in the video, but as far as I can tell these appear to be scratches. Having said all this I have reapplied the preload and the eccentricity/run out looks a lot better. I'm also not seeing any movement or expansion of this crack, even when applying some lateral force to the spindle. I'm just waiting for a pin hooked wrench so that I can try and properly adjust the preload down, but would be keen to hear any thoughts and advice on this. These bearings are expensive and I'm guessing there's little point in replacing the back bearing on its own. I do have Colchester part numbers; 03-912 Front and 03-913 Rear, but can't see any sizes or equivalent Gamet part numbers. Has anyone here pulled the spindle and replaced bearings? 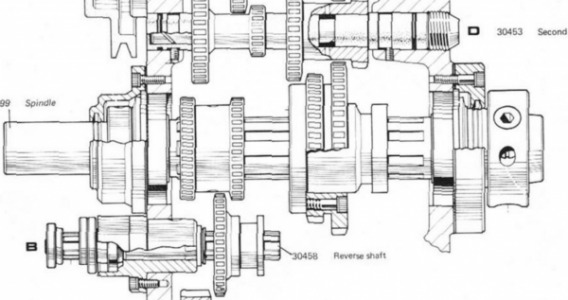 It looks like I can probably take the spindle shaft out of the front of the headstock, If I can only loosen remove the rear bearing, but concerned about causing any more expensive damage. I have looked around online, but no clear procedure for this. Just got a quote back on the bearings from a UK supplier (on the original Colchester part no's) @ £ 650 including carriage/tax (USD 845) - slightly better than I had feared, though if I go this route I want to double check that the spindle is true and there are no other horrors lurking in the headstock. Alternatively I did see a couple of Mk1 headstocks being sold by breakers at around half this price - the bearings would be a bit of a punt but offers a supply of donor parts. you have to wonder what caused it- lack of lubrication or particulate contamination, maybe infant mortality? Being operated probably for years with the bearings loose did them no favors, either. I would be inclined to suspect that whatever is wrong with the bearing has been wrong since it was new. In which case, someone in QC at the factory screwed up. The problem with buying a used headstock is that you never know before-hand whether or not you are buying someone else's problems. Before doing either that or buying a new spindle tail bearing, I would pull the spindle and take it to someone else to mount it between centers and confirm that there is nothing wrong with your spindle. If there isn't, I think that I would buy the new bearing (assuming that all of the other parts on the spindle, including the head bearing, are still good). If there is something wrong with the spindle, then buy a used headstock. Thanks Mark and Wa5cab - good points from both. I figured I can check the spindle for true by mounting it up in v blocks and indicate it out on a surface rotating to confirm any twist or bend. If there's any damage to the spindle then I will definitely take a punt on another head and salvage the best parts. I'm also thinking I should tighten it all up first and test to see if I've managed to re-seat the bearing properly - depends on how the bearing looks when it all comes out. As in, the factory that made the bearings or the factory that assembled the lathe, had a quality control failure that incurred this problem? someone in QC at the factory screwed up. That is the sort of thing I would expect from the Chinese mainland, but not Old World manufacture. I hope this turns out to be the previous owner's operator error, or neglect and abuse. That, I could live with. In any case, I wish you the best of luck, and I do surely appreciate your dedication to QC! I meant that I couldn't think of anything that could have been done to the fully assembled machine that would have cracked the inner race. So absent believable proof to the contrary, I think that the machine must have shipped new with the problem. My first step if I were trying to investigate the cause would be to determine whether the factory had Labour problems around the time that the lathe was built. Deliberate sabotage would appear to be the most believable cause. Is there something about Colchester bearings that is unique? There are millions of bearings in the world and I find it hard to believe that a high quality replacement cannot be found at a more reasonable price. With that said, it is hard to figure out how a bearing race would crack while in place unless it was cracked on installation in a bore that is not fitted well for it. By the way, SnakeyJ, you did a really nice job of presenting your issues. Clear, concise and well thought out. Well that was easier than I'd hoped and the bearings look undamaged and pretty darn good to my eyes for almost 50 years. No discernible eccentricity in this spindle - can't quite see what's been causing the trouble, but going to rebuild and test it again. Fortunately that was for both, though still bloomin' expensive! More about the bearings for any future travellers.. Both are Gamet precision taper roller bearings with a flanged cup - manufactured by 600 Group, Colchester Tools. The bearings are produced in three grades with 1.5-0.5 micron run out. Front spindle bearing is marked L2350 on cup and X L2350 on inside. Outer diameter is 90mm + 4.66mm for flange. Inner diameter is 50mm. Rear spindle bearing is marked L7021 on cup and X L7021 on inside. Outer diameter is 85mm + 4.66mm for flange. Inner diameter is 45mm. The part numbers are not current, but a quick comparison with their catalogue gives front spindle bearing is possibly part 85050 / 85090C and the rear spindle bearing is possibly part 119045 / 119085C (neither of these are definitive and anyone ordering should use the original Colchester part numbers (03-912 Front and 03-913 Rear). I've attached a copy of the current Gamet catalogue if anyone fancies some light bedtime reading! Hmm, I reassembled this and was getting much better run out at the spindle nose - 1-2 micron. I even dropped the oil and cleaned the sludge out of the headstock gear box.. (refilling with Westways ISO 32 mineral oil - Shell Tellus 27 equivalent). However, I ran this up gradually through the speeds to 1800rpm, to bed in and allow things to warm up and things loosened up again and I was getting 5-6 microns afterwards. I tightened up again and eliminated this play, but after a quick run I still see 5 micron run out and if I run at speed for 5 minutes plus the expansion is ceasing and causing the phase converter to trip out. Odd as neither end is getting properly warm. Interesting that you claim a seizure?.....Ive had a bit to do with Gamet bearings over the years,and seen a few ruined too...........Any seizure usually is the rear bearing(,if the oil level falls low,)and the bearing being only a slip fit will turn on the spindle ,often welding itself to the spindle in a few spots.......So far ,the spindle isnt ruined,but when you press the race from the spindle ,bad scoring results......and the spindle will need a hardchrome and grind...........Ive also seen Bantams lock up on the plain bearings in the pulley assy,if the oil fails...............so clean up oil sight windows,and keep the oil level well up..........dont be decieved by dirty sight windows,..............another Gamet fact.....if you take the rollers out,and reassemble them out of order,runout will increase greatly.......I dont know why. I've done some further testing and certain that the motor cutout problem is not related to the bearing seizure - not enough and certainly no adverse heat build up in the bearings and I can still freely turn the spindle immediately after it cuts out. The motor cuts out after 3-5 mins running fairly consistently and then takes a few minutes to cool down before it will run again, so I'm guessing there's some thermal cutout on the Brook Crompton, a twitchy breaker on the rear cover or brake or possibly wiring. I guess it could also be a supply fault, but I run the lathe independently from a static 240V single to 415V 3phase converter and no fault indicated here. The motor looks original and is filthy, so I dismounted and gave it a bit of a clean. The bearings turned freely, but surrounded by grease that seems to have hardened off - so I cleaned this off and re-lubricated the bearings with lithium grease. Quick shot of the motor plate and wiring for future reference..
A good opportunity to clean some hard to reach areas and check the belt tension - a good 3/4" play in this, but worn and at maximum extension. I've refitted and run the motor, but will get a new belt (Fenner A34 - A section 8x13mm V belt 34" long). Everything was refitted last night and I quickly spun the motor up to confirm it was wired back in correctly. Too late for a full test, but hope to get some time this evening. It also seems a good tight fit. I changed the oil (and cleaned the sludge/swarf!) out, making sure the oil ways were clear for both bearings as they seem to lubricate by capturing sprayed oil from the headstock and circulating by gravity - simple enough but had me a little worried as any blockage would starve the bearings of lubrication. I didn't take strip out the pully/drive shaft, but it seems to turn freely without obvious play. I did clean out all the oil ways for the other drive/gear shafts. I didn't strip the rear bearing as this had a nylon locking/retainer washer around the cone. However, the front bearing had a sprung wire which I removed on disassembly and I did strip/clean this one - a thin film of black gunge on the non contact surfaces of the cage, but no obvious scoring marks or damage. Microns as in millionths of an inch? Or some other increment? If the motor shutdown persists, buy/beg/borrow/rent a clamp-on ammeter (or adapter if you already have an AC ammeter) and measure the current in each of the three legs. If less than the posted breaker rating, replace the breaker. Great thought thanks, I've got a clamp meter at work so will borrow it for the weekend. Embarrassed! - The motor cutout was caused by excessive boost setting on my power supply Transwave Static Converter (Transwave STC2HD - 3hp/2.2kW Single to 3-phase 240v to 415v). I had gradually increased the setting up to the highest to give sufficient boost for dual speeds, but ignored the bit about trimming this back down if the boost light stays on. After suitable adjustment I was able to get the lathe to run for 15-20 mins without cutting out at full speed (1800RPM). I'm not getting a lot of heat from the bearings, but can feel some warmth through the casings and expect I have some room to tweak them further if needed. The run out measured at the spindle nose is now about 0.006mm or a little under 3/10,000" - not too shabby for a 50 year old lathe and still within the shop permissible limits. I think I will pass on replacing the bearings for the immediate future. ** I found a very useful example of Colchester's test/acceptance certificate for the Mk1 Bantam, which nicely shows the testing method and their tolerance/limits posted here as a 1 page pdf. At the end of an unsupported MT4 15" test bar the eccentricity/runout is amplified to about 0.03mm or a little under 2 thou - a massive improvement over where I started at the top of this thread ( <15 thou runout at 6" chuck mounted 3/4" test bar). The headstock is aligned but only tightened down by two front bolts and rear offset adjuster (I forgot to tighten the rear bolts off before refitting the banjo). I'll tighten these up tonight and cut a new test bar - hopefully these will look a lot prettier than my last attempt and not show too much taper! ** I found a very useful example of Colchester's Standard Metric accuracy chart for the Mk1 Bantam (slightly newer 1976 example), which nicely shows the testing method and their tolerance/limits posted here as a pdf. Ive found that Bantams often have no visible movement on a tenths gauge.........I know mine which had new bearings fitted by the college has no measurable spindle runout............I spent a day aligning the head to cut exact over 8"...........then forgot and set the head to a taper to resize hundreds of Honda car pistons,which in typical Jap fashion used different cylinder bores in different markets to discourage aftermarket parts and grey imports. I was offered a taper attachment by a friend ,but couldnt be bothered fitting as the cross screw would need to be restored to length....The taper attachment actually came from my lathe,removed by a college teacher before sale......unfortunately he also cut off the cross screw. How is your Colchester lathe rebuild coming along in the, "Isle of White"? Every thread I see that includes, Gamet Bearings, I pay attention. Just curious, it appears you were going to replace the head stock Gamet bearings? Hi Jeff, I did buy and install the new Gamet bearings (the installing being the least painful part). It's actually a very easy job on the Bantam lathes and plenty of decent advice on bearing preload tension on a number of forums. The lathe runs much smoother and more quietly afterwards - the original bearings having almost 50 years use on them. I've done a couple of other builds since then, restoring an ill treated RF-45 Mill, a Naerok Drill Press and now an old English lathe (Portass Dreadnought) - but have a queue of jobs waiting for the Bantam once the workshop is cleared and tidied.